This week you can still feel it's Winter when you step out at night. Lows are still in the low 30s or heading into the 20s at night...but the days, oh the days. Highs of mid-50s to 60s. Makes you smile and your heart sing. So, in Asheville, what's happening in the gardens here at Abbington Green Bed & Breakfast Inn when you get outdoors on these days? A few things are reminders of Winter while we transition toward Spring. First, the greenhouse is in full floral show. As you walk through our gardens, the greenhouse is located on the south side, built directly onto the house. In fact, the greenhouse structure was on the original set of floor plans for the house over 100 years ago. The only way to enter it is from the ground floor of the house. It has raised beds so it's easier to reach and to tend the plants that we over-Winter. 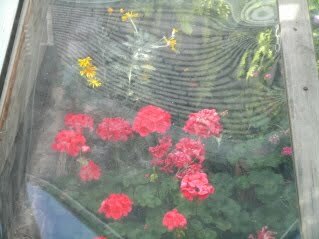 Those plants include some herbs, the ferns that grace the porches during the warm weather seasons and also the colorful pellargoniums...also known as geraniums.The view into the greenhouse from the garden is colorful indeed! 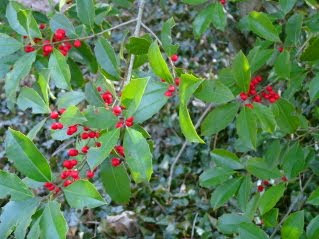 Also, we love to see that hollies are still showing their lovely red berries for a while longer. Along the walkways through the Chartreuse Garden and the Shade Garden and heading toward the street, you'll see several examples. While so many plants sleep through the Winter months in Asheville, hollies have bright green foliage and red berries all through the Winter into the Spring. And the third treat you'll see is in the Chartreuse Garden. 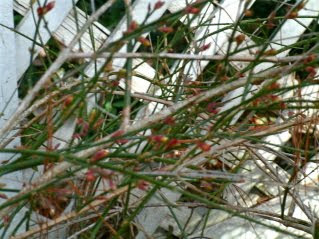 It's a plant that blooms at the end of Winter and it's called "Winter Jasmine". Yellow flowers are just about the burst open...probably will in the next couple of days. The flowers appear on a tangle of woody stems that look like dead sticks for the early part of Winter.They will put on a lovely show even through the almost inevitable snow storm that, although short lived, will undoubtedly arrive in Asheville NC at least one more time this Winter or early Spring.